Edwards and Associates were proud to sponsor the Schooner Regional Development Corporation's Burin Peninsula regional Strategic Planning Forum. 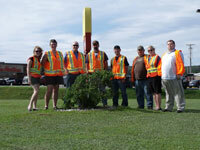 Edwards and Associates and Information Brokerage employees pose together at their locally sponsored Adopt a Spot in Marystown. Edwards and Associates and Information Brokerage Ltd employees pose together as part of their Cancer Relay team, Cupcakes Against Cancer. 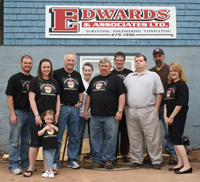 Edwards and Associates Ltd. was incorporated in 1985 and is 100 percent Newfoundland owned and operated. The principals of the company are professional surveyors who, through their experience, expertise, education and flexibility in scheduling, have been able to supply clients with a wide variety of surveying and engineering services. Cadastral surveying has been the core activity of the company and all other disciplines have evolved from it. The detailed analysis and accuracy requirements inherent in cadastral surveying have prepared personnel to meet the challenges of related disciplines with a positive and confident attitude. Other major disciplines include software development, engineering surveys, offshore positioning, mine surveying, project management, construction surveying, geographic information management and consulting. Edwards and Associates Ltd.’s personnel have worked in all the major areas of surveying and positioning, either independently or through subcontracts. They have proven themselves in high pressure situations involving substantial sums of money and responsibility, and they all have a positive attitude that enables them to interface well with fellow personnel, clients and regulatory agencies. Edwards and Associates Ltd. have offered professional services in provincial, national and international markets from its office in Marystown, NL.